Chef Rram’s Fish Head Curry is a favourite Malaysian dish with both Indian and Chinese origins. 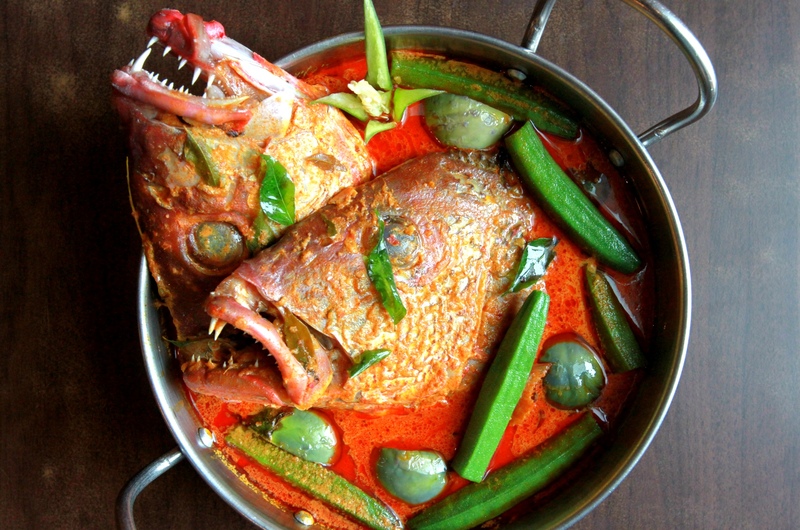 The fish head of a red snapper is semi-stewed in a Kerala-style curry with assorted vegetables such as okra and eggplant and usually served with either rice or bread. Heat oil in a medium pot and add screwpine leaves and lemongrass. Sauté until golden brown and fragrant. Next add fenugreek, star anise, cardamom, bay leaf and curry leaves followed by whole garlic. Sauté for a few minutes and add shallot paste, ginger garlic paste and tomato plum. Fry for a minute and then add chili gilling and sauté till the ingredients cook well, reduce the flame and add turmeric powder, red chili powder, fish curry powder and meat curry powder followed by tamarind juice. Stir till the gravy thickens and pour water as required. After 15 minutes or so, once the curry boils, add in the red snapper head and cover until it’s cooked. Lastly, add lady’s fingers, eggplant, ginger bud flower and season with salt. U r rite buddy. I ve been cooking for donkey years but never come across such a complicating fish curry recipe. oops! when did Keralites start making fish curry like this? cardamon? staranise? bay leaf? Never, we Keralites don’t make fish curry like this…. Agree with above comments! Not authentic at all…is this a fish head curry joker self proclaimed chefs recipe? Where did Sunway Resort find this joker chef from ?